Whether it’s for a birthday or just for the fun of it, throwing a dog party is a great way for owners and their companions to enjoy quality time together. As such, there are a few things to consider when planning such an event, not only to ensure a fun experience but for safety reasons as well. Location is a great place to start your planning process. There are few things to consider though, such as the natural instinct that dogs tend to possess- being territorial. Not all dogs are as territorial as others, but you don’t want any unnecessary roughness on the field. If you choose a location that offers a swimming area, or even a wading pool, be sure that the water isn’t chlorinated. Dog training centers and dog parks are great locations, not only because of their space allocations, but also because they keep the location neutral for the playmates. Just be sure that there are no dangers, such as debris, fallen branches, or even trash around. And even though glass is prohibited in these locations, it doesn’t mean there won’t be some, so inspect the area before you launch your event. One practice that’s important to keep in mind is that the event is for both the owner and dog alike. This means it shouldn’t be treated as an occasion to puppy-sit. If an owner is bringing their dog, they have to stick with them. Basically, guests should be accompanied by their owners, to ensure that everyone stays safe and enjoys the fun. This also means that you’re going to want to pick your guests wisely. It’s true that dogs don’t always get along well with others, and some tend to be a little more aggressive than others. If you want your party to be enjoyable for everyone, you have to ask yourself: Will everyone get along well? You don’t want to be constantly breaking up fights or putting anyone in harm’s way during the party. So be careful and pick your guests carefully. You’ll want to make sure that everyone is up-to-date on their vaccinations. There’s a big problem with owners not getting their dogs vaccinated, and it’s not good for them. For your dog and everyone’s safety, only allow guests that have their shots updated. Leashes should be kept on ready. It’s good for the dogs to get out some energy and run around while they play, but owners should be able to restrain their dog in the case of an emergency. So be sure everyone has a leash handy and possibly a harness if they can. Like any other event, there’ll likely be treats to enjoy. There are some new concepts you should consider including, such as the treats buffet. Containers remain closed while each guest-dog chooses the one they want to enjoy. When they ask nicely, they get a treat and remember that manners are important. Also, be sure that you keep water readily available, especially as the weather begins to warm up. Of course, food isn’t restricted to just the dogs. The owners are bound to get hungry as well, but food should be limited in availability and ingredients. Beware of chocolates, onions, and even the common raisin snacks as they are poisonous to dogs. And it should be clear to the owners not to feed the dogs any human food, even to their own dog while at the event. You can include dog-friendly homemade baked goods that are good for both human and canine consumption. Just be sure that no one is allergic to any ingredients, like peanuts. What else are the other guests bringing? Snacks and treats should be carefully supervised, since dogs may get a little jealous and decide all the treats are theirs. It’s important to devise a schedule for playtime events and snacking to make sure everyone gets a chance to enjoy the treats and is monitored safely. When it does come to play toys and party favors, be sure that everyone gets a fair share. You don’t want any pup getting jealous of another. Make sure that toys are evenly distributed and everyone gets a chance to play. 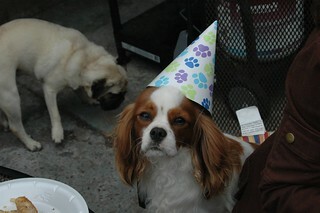 Organizing a dog party is a little similar to preparing a party for kids. As long as you take steps to ensure that everyone stays safe and happy, the occasion will turn out to be an event that everyone will enjoy and wish to happen again.